TutHost Review 2019: Is TutHost a Good Hosting? Established in 2004, TutHost is one of the pioneers in the web hosting industry in Ukraine. They serve more than 7,000 customers, targeting all kinds of businesses in Ukraine and around the globe. TutHost is a Ukraine-based web hosting vendor that has been in operation since 2004. Over the years, the company has grown their portfolio, now serving more than 7,000 customers not only in Ukraine but in Russia, Belarus, Turkey, and the Netherlands as well. They are on the list of the top 20 hosting companies in Ukraine by market share. Their hosting services include shared hosting, VPS hosting, dedicated servers, WordPress hosting, and reseller hosting. 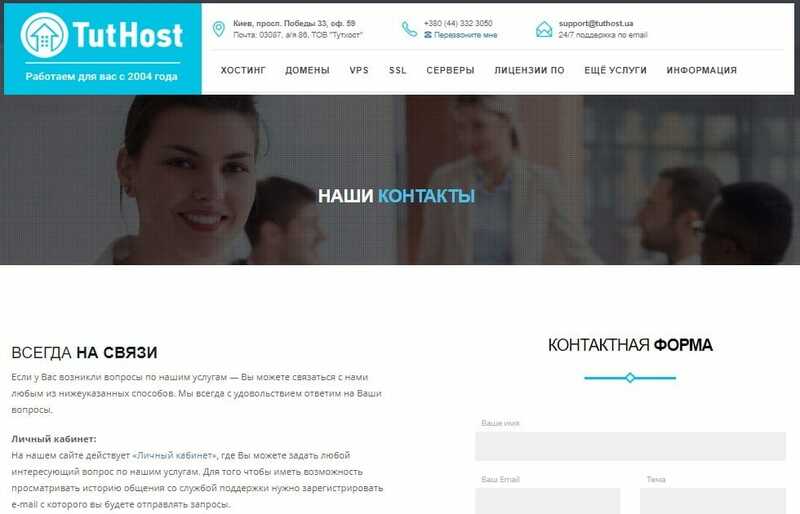 The TutHost website is only available in Ukrainian. TutHost provides web hosting packages hosted in the largest data centers in Ukraine. They give clients the freedom to choose the location of their servers, which are housed in three data centers: Ukrtelecom, Volya, and Colocall. Their web hosting plans are designed to accommodate and serve even large businesses with complex websites. The hosting packages come in the typical shared web hosting plans as well as other less typical plans like SSD hosting, gigabyte hosting for large companies, mail hosting, VIP hosting for resource intensive websites, reseller hosting, and hosting for Joomla and WordPress websites. TutHost ensures the security of your data by providing a double backup of your data. They perform daily, weekly, and monthly backups operated on all SAS hosting servers disks in RAID1. The backup copies are stored on several servers not only in Ukraine but also in other countries. This means that even in the event of a complete failure of the primary data center where a client’s website is located, a copy of their website data is always safe. Tuthost employs isolation protocols that ensure that websites with heavy resource needs do not affect other websites hosted on the same server. Additionally, the PHP version for the account can be changed at any time directly from the control panel. You can flexibly configure many PHP parameters to customize the optimal performance of your particular website. TutHost is competitively priced for the services they offer. They have a loyalty program where the longer you stay with them, the greater your discounts will be. They do offer a lot of billing options with discounts available for clients paying for three months, six months, one year, two years, or three years in advance. What’s more, their tariff plans are scalable without surcharge. This means that you can change your hosting package at any time from your account without any additional costs. TutHost also offers a free ten-day trial period where clients can test their services. This is in addition to the 30-day money-back guarantee with no questions asked, but the vendor has no uptime guarantee. You can reach the TutHost support team via telephone or email. Alternatively, you can get in touch with them on the support live chat or ticketing system on their website. Their round the clock customer support team comes across as knowledgeable and competent. They were fast to respond to customer queries every time I’ve contacted them. In addition, TutHost has a resourceful knowledge base with very helpful tutorials and documentation. For businesses in Ukraine, TutHost hosting solutions make a strong case for consideration, whether your business is a small startup or a big corporation. As a pioneer in the Ukraine hosting industry, the company is a respected brand that continues to deliver reliable hosting solutions to an ever-growing number of customers. Start your free trial at TutHost! Wondering how TutHost stacks up against other Web Hosting companies? Enter any other Web Hosting company and we will give you a side-by-side comparison.